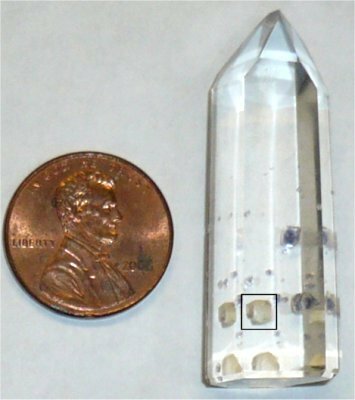 Reciprocal-Space Quartz has at least one open space inside (or outside) of the crystal. It is open space where another crystal once was but has disappeared leaving only the space behind. An Enhydro, a space containing water, is one form of a Reciprocal-Space Quartz. Fluorite-Included Quartz Crystals are another as many of them have Reciprocal Spaces where a Fluorite Crystal was. The mineral that disappears is often Calcite, but not always.